Shannon is a Canadian living abroad, splitting her time between Auckland, New Zealand and Vernon BC, Canada. While in NZ, she works from her home studio. Her time in Canada is largely spent at the Vernon Community Arts Centre, making pots, exhibiting and selling her pottery in the Okanagan. She has also taught pottery classes. I make functional one-of-a-kind tableware and homeware. I believe handmade objects, both functional and decorative, can enhance our daily experience and spaces by creating relationships between maker & user and between user and object. It’s these relationships that can connect us to our spaces, daily routines, special ocassions and create memories. On simple refined forms, I add repetitive patterns to create rhythm and texture. I use stamps, found objects and pottery tools to create patterns. My intent is to use these tools in a manner whereby the individual mark is inseparable from the overall pattern. Glazes are kept simple and are chosen based on their ability to enhance the stamped impression and to unify the object by marrying pattern to form. My aspiration is to make pottery that is both useful, quietly elegant and will bring light and interest to your surroundings. Recently, I have also been exploring Obvara pottery. Again, continuing to make simple forms and allowing this alternative glaze process to create random and surprising patterns. 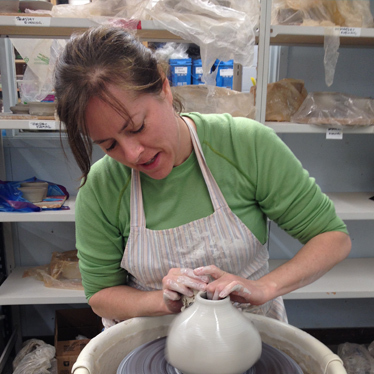 Shannon studied art & design, majoring in ceramics receiving a diploma from Sheridan College School of Craft & Design in Oakville, Ontario and a BFA from Nova Scotia College of Art & Design in Halifax, Nova Scotia.